Heat the olive oil in a non-stick pan over medium-high heat and cook the garlic, cumin and crushed red pepper flakes (if using), stirring until fragrant, for about 1-2 minutes. Add the crumbled tofu and cook for about 5 minutes or until slightly browned. Season with salt and pepper. Set aside. Mix the diced veggies with the avocado and add the lime juice. Season with salt and pepper and set aside. 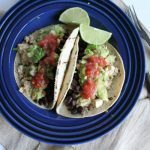 To assemble your tacos: layer on top of the tortilla in this order: tofu, black beans, avocado mixture and garnish with the chives and/or green onions and pour on the salsa to your liking.